Did you know that approximately half the food produced in Canada goes to waste? This reality is even more upsetting when you couple it with the fact that over 4 million households across the country are impacted by hunger. Major corporations stepping up and finding ways to preserve and donate their leftover food is one of the biggest keys to solving this issue and one company is doing just that. Coffee giant Starbucks Canada announced its plans to help reduce food waste and hunger in the country with the launch of Starbucks FoodShare. This initiative, done in partnership with Canada’s largest food rescue organization Second Harvest, will see the company distribute all unused food from their company-owned stores to various non-profit organizations across the country. Talking about the importance of this initiative, Starbucks Canada Vice President Luisa Girotto says, “Wasted food is a wide-scale problem for everyone in the food business, while more than 4 million Canadians are impacted by hunger. Though Starbucks has for a long time donated pastries, breads and other baked goods, the FoodShare program will allow them to maximize their donations by providing an efficient and safe way to preserve and transport fruit, dairy products, salads and other perishable items. 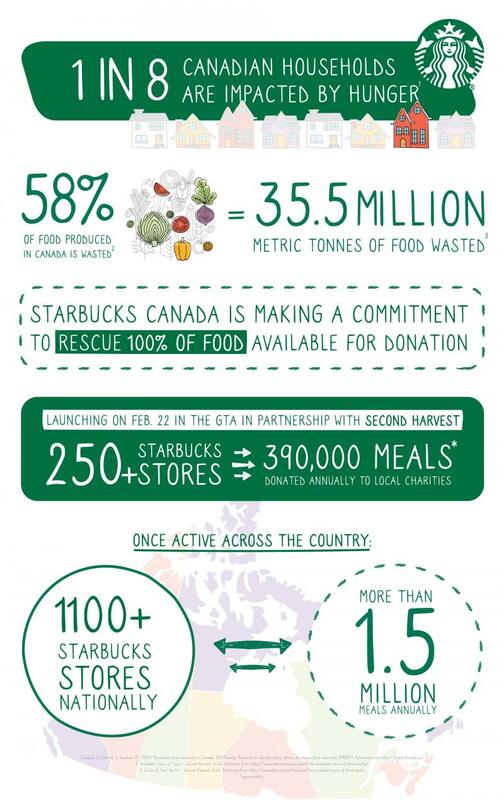 Along with addressing the nation’s hunger issue, Starbucks Canada also promises that Starbucks FoodShare will have a positive environmental impact on the country as well. Because the unused food will be going to those in need, they will be out of the landfills, therefore reducing the company’s environmental footprint significantly. This, along with their plans announced last year to discontinue all plastic straws by 2020, shows Starbucks’ continuous efforts to be environmentally and socially conscious. The plan is to have the program rolled out nationally by 2021, with the initiative expected to provide over 1.5 million meals annually. By phasing out plastic straws, Starbucks will reduce the total number used each year by 1 billion. Feel free to explore, experiment and dream up any drink!